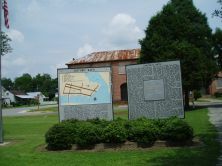 Bath, oldest town in North Carolina, was established in 1705. The first settlers were French Huguenots from Virginia. Among the early English inhabitants were John Lawson, author of the first history of Carolina (1709) and Christopher Gale, Chief Justice of the colony (1712-17, 1722-24, 1725-31). Thomas Cary, Governor, 1708-11, was a principal figure in the uprising known as Cary’s Rebellion. By 1708 Bath consisted of 12 houses and a population of 50 people. Trade in naval stores, furs, and tobacco was the foremost occupation. In 1707 a grist mill was established by a group of the leading citizens. A library, given to St. Thomas Parish in 1701 by the Reverend Thomas Bray, was the first public library in North Carolina. Bath’s early history was disturbed by political rivalries, fever epidemics, Indian wars, and piracy. Cary’s Rebellion (1711) was a struggle between former Governor Thomas Cary and Governor Edward Hyde (1711-12) over the role of the Quaker Party in the politics of the colony. It was settled when troops from Virginia arrived in the Bath area in July, 1711. Hyde remained in power, Cary being sent to England for trial. In the summer of 1711 occurred a severe epidemic of yellow fever from which many inhabitants died. Immediately began the Tuscarora War, 1711-15, fought between the settlers and the powerful Tuscarora Indian nation occupying the region between the Neuse River and Virginia. On September 22, 1711, the Indians attacked without warning the plantations around Bath, and many persons fled to the town for refuge. Troops under Colonel James Moore were sent from South Carolina to assist the North Carolinians. On March 23, 1713, Moore took Fort Nooherooka, principal Tuscarora stronghold, freeing the Bath area from the threat of further Indian attack. Bath was also a haunt of the pirate Edward Teach, better known as “Blackbeard.” Teach, a friend of Governor Charles Eden and Tobias Knight, his secretary, was privately encouraged by them in his piratical activities. He was killed by Lieutenant Robert Maynard of the British Navy in the fall of 1718. After this period of turbulence ended, Bath became a center of more peaceful, settled life. St. Thomas Church (Episcopal), the oldest standing church building in North Carolina, dates from 1734. Reverend George Whitefield, pioneer evangelist, visited Bath on several occasions between 1739 and 1765. The Palmer-Marsh House, Bath’s oldest and in the colonial period its largest residence, was erected about 1744. The General Assembly met in Bath in 1744 and 1752. In 1746 the town was considered for capital of the colony. Governors Thomas Cary and Charles Eden (1714-22) made Bath their home for a time, as did Edward Moseley, long-time Speaker of the General Assembly. 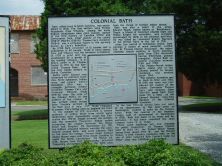 In the late Colonial period Bath lost much of its importance to the new town of Washington, located 12 miles up the Pamlico River. With the removal of the Beaufort County seat of government to Washington in 1785, Bath lost much of its trade and importance. It has since remained the small country town it is today. Three early buildings are now available for public inspection: St. Thomas Church, built in 1734; the Palmer-Marsh House, dating from about 1744; and the Bonner House, a 19th Century residence built on the site of John Lawson’s 18th Century home. Other sites and buildings are marked.